Well, here they are again. 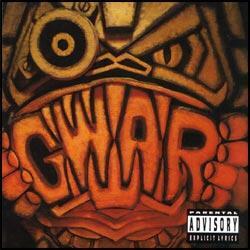 GWAR, scumdogs of the universe, or something like that. More a theatrical troupe than a full-fledged band, GWAR rely heavily on costuming, posturing and attitude rather than true skill to deliver a bunch of half rate punk and metal rip-offs. Sure, it's funny in a juvenile sort of way, but I guess I get tired of the whole thing pretty fast. Music's OK, artwork better, the whole package? I'll pass, thank you very much. Musicalis Simplisticus, perfect for every junior high kid that wants to piss off their parents.